Go ahead and vent with this 2.2 cu. ft., 1000 W LG microwave. With ventilation features that can literally be pulled out to capture fumes from even the front burners of your range, and a warming lamp that keeps dishes hot until serving, this is one microwave worth adding to your kitchen collection. When you're cooking for company, you need a microwave that starts out looking goodand stays looking good. LG's 2.2 cu.ft. microwave handles that family-sized casserole, and looks good doing it, with sleek, intuitive SmoothTouch controls located on the front of the stylish glass door. Cleanup? It's a breeze, thanks to EasyClean interior's stain-resistant technology. And with the enhanced ventilation of ExtendaVent 2.0, you don't just have a microwaveyou have more. 2.2 cu. ft. Over-the-Range Microwave with Slide-Out ExtendaVent in Black Stainless Steel Go ahead and vent with this 2.2 cu. ft., 1000 W LG microwave. With ventilation features that can literally be pulled out to capture fumes from even the front burners of your range, and a warming lamp that keeps dishes hot until serving, this is one microwave worth adding to your kitchen collection. 2.2 cu. ft. Over-the-Range Microwave with Slide-Out ExtendaVent in Black Stainless Steel is rated 3.3 out of 5 by 4. Rated 1 out of 5 by Frank66zhao from The worst microwave oven I bought it 18 months ago, use it less than 12 months. now it is not working. Rated 2 out of 5 by MrBillyT from Beware of manufacturers defects! Great for cooking! But with so many electronics and being stainless steel, watch for flaws in the display, fan speeds and dents in the door. Our original issue was the dent. The door was replaced. It contains the electronics which had the fan and display flaws. Now, our warranty replacement model showed up with two of the four filters missing and the lights don't work. More resolution needed! Rated 5 out of 5 by brainstorm from Excellent microwave! 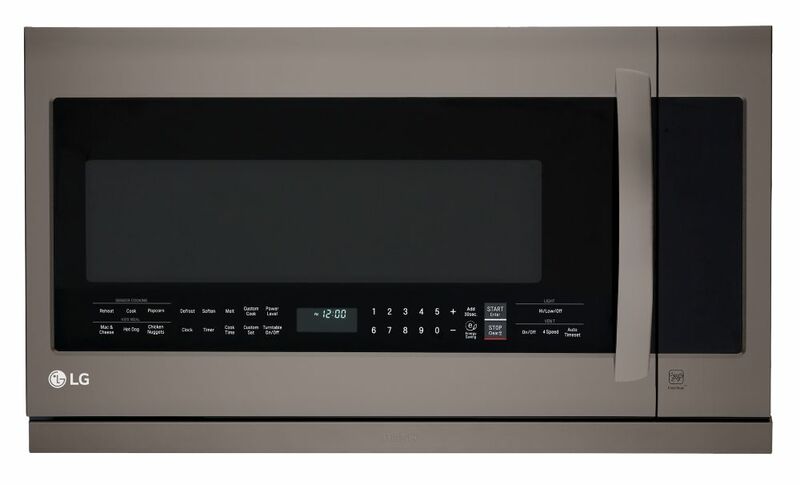 I like all the different options for using this microwave and it's performance. It is perfect for my family and we have had no issues. It is also easy to use. Rated 5 out of 5 by cookie from great microwave we love this mw. the extended vent captures all the steam that used to escape and cover the cupboards .defrosting is a breeze and lots of power for cooking. best one we ever had.